Sapphire waters to your left. Exquisite Renaissance façades on your right. Centuries-old cobblestones beneath your feet. Sun-drenched islands on the horizon. The fragrance of lavender and sweet mandarin oranges wafting from an outdoor market. A scenic morning ride, a swim at midday and an impossibly fresh seafood dinner. It's your new routine. How do you like it? From bustling Split, home to Roman Emperor Diocletian's Palace, sail by private boat to Brač Island Old olive groves, crumbling walls and white woolly sheep line a coastal—and hilly!—bike ride to Pučišća, a quiet fishing village After a welcome reception in the hotel's courtyard, savor a delicious Croatian-style barbecue in the hotel's lush garden, surrounded by almond and fig trees. Enjoy a boat ride (and maybe even a cannonball off the upper deck!) before a coastal hike on the lavender-scented island of Hvar Check out Croatia's most impressive collection of Venetian Renaissance architecture in Hvar Town Spin past ancient stone terraces topped by tiny plots of vegetables, grapevines, fig trees and lavender en route to Stari Grad. Kayak the coves of the Pakleni islets, stopping to snorkel, swim and kick back on a tranquil beach It's a relaxing boat trip to Korčula Island—a great time for reading or socializing! At tonight's dinner, grown-ups are treated to a local experience while kids enjoy an adult-free meal at a local pizzeria. Past quaint villages, vineyards and almond groves Need a break? 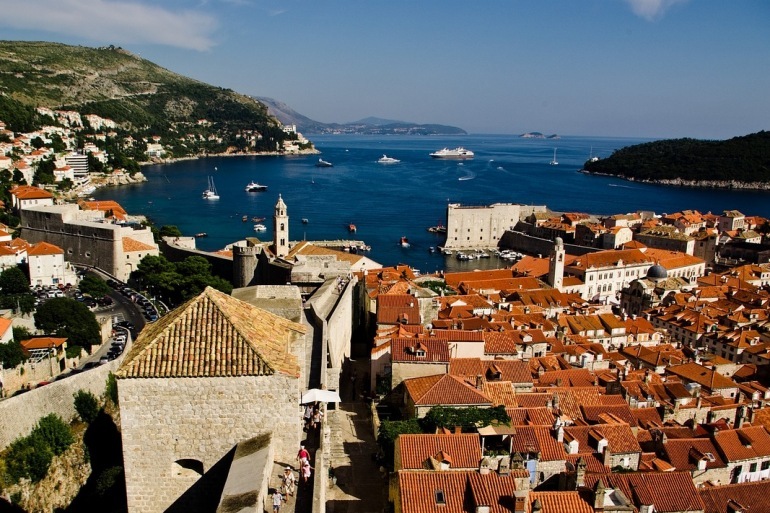 Pull over at a family winery to sample sweet white wine The medieval town of Korčula, a treasure trove of stone palaces and arched bridges, is a fun place to discover Stroll 82 feet above dazzling Dubrovnik during a guided walk on the city's defensive stone walls. On Inn Trips when a child shares a room with one adult or two children share a room, a 10% discount applies to children 17 and younger. The third and fourth youths in a room will receive the tiered discounts described above. When one youth is in a separate room a 10% discount is applied to the trip price, but the full private room charge applies. On Camping Trips we provide spacious four-person tents. On Family Trips, Backroads normally provides one tent per two guests. On non-Family Trips, children 17 and younger receive a 10% discount when sharing a room with two adults. On non-Family Trips, we are unable to accept reservations for children under the age of 14 and we allow only one family per departure traveling with a child or children 14 to 17 years old. All minors (under 18 years) must be accompanied by at least one adult. When one youth is in a single room the full private room charge will apply.